As part of the 2016 Summit Sweepstakes: Road to Freedom, Mansfield gave away five Milwaukee® 9-Tool Combo Kits and 25 Outback Steakhouse® $100 gift cards. Thirty-one prizes were given out to winners nationwide. 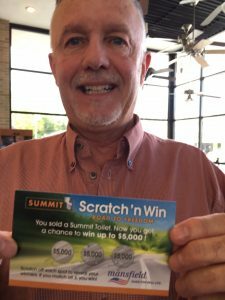 The more Summit toilets purchased during the sweepstakes timeframe, the more chances licensed plumbers and contractors had to win a prize.